WIFI-V01 controller appeared with the installation of controlling software on mobile devices with Android or IOS system, such as android phone, Iphone, tablet PCs, they can remote control LED lighting products through Wi-Fi, which makes LED control more intelligent and humanization. One WIFI-V01 controller can be used as dimmer, CT controller, and RGB controller, only need to select the right control interface in the software. In addition, this model has DIY function. Users can get any effect they want based on our controlling software. If you don't have any mobile devices with the controlling software at hand, you could also use our RF remote control to control it. This model designed for constant voltage led products, such as led strip, led modules. For controlling more led products, amplifier is available. ●Support both Wi-Fi control of Apple products (iPod, iPad, Iphone), Android mobile devices like Samsung, HTC, and RF wireless remote control. ●With the 3-in-1(Dimming, CT, RGB) apple/android software. One device suit to different lighting application scene. ●Memory function to save scenes anytime anywhere for next play. ●WIFI-V01 is designed for constant voltage led products, working voltage auto fit to DC12-24V. ●Wi-Fi control based on 2.4GHZ frequency, RF remote control based on 433.92MHz. 1. FreeColor V1.0 software installation and SSID (system settings ID) reset. ●Android: the software copy in CD which packed in the box. Open the CD and double-click the "Freecolor.apk" to start the installation. ●IOS : the same as the other software from App Store download the "Freecolor" from App store and install. If more than one WIFI-V01 in close area, we can reset the SSID for the devices in order to avoid they jamming each other. The SSID are 16 in max. The initial default Username: admin, password: admin. And "Login". ④If necessary, setting the linking password for more security. 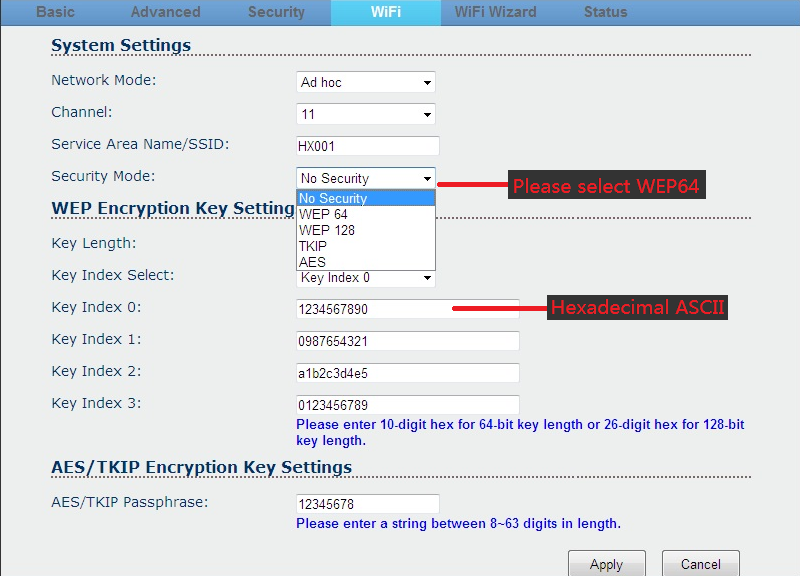 A.Select the "Security Mode": WEP64. After setting, click "Apply" to finish. 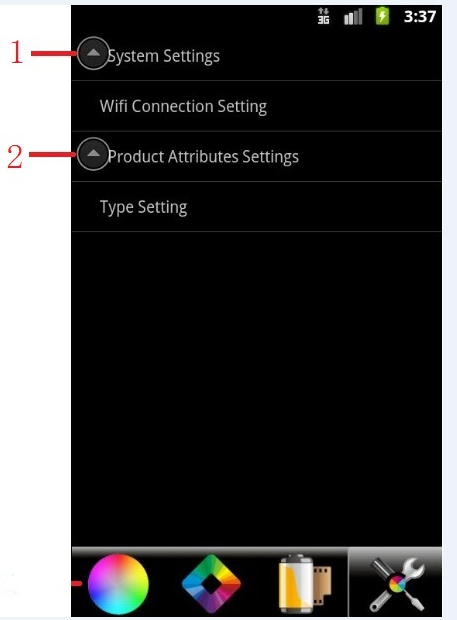 2)After step 1), open the WIFI setting interface on the device with WIFI function will find the WIFI which named "HX---", connect it. 3) Open the "FreeColor" and start operation. There also have "WIFI Connection Setting" page in the software. Display the R/G/B gray value, “L”: the current brightness level. Select any static color mode from the board. Slip to adjust the current light brightness, 100 levels in total. Click to system setting page, set the WIFI connection and select the application scene (Dimming, CT, RGB). Go to DIY modes select page. Display all of the DIY modes. Go to select the dynamic modes. Display the current application scene. EFFECT：select the different effect based on the different mode. This page displays all of the DIY modes which have been saved, up to 12 modes in total. Product Attributes Settings：Type Setting (RGB/CT/DIM).